I woke up at 4am yesterday and couldn’t get back to sleep. I thought of this poem, which I’d written in the wee hours of some other sleepless night long ago. ah, sleep. that which eludes me. marvelous marmalade in the grass. you get too much. every time. 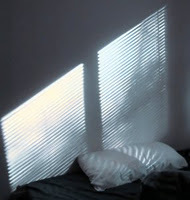 This entry was posted in Poetry and tagged insomnia, spider. Bookmark the permalink.